bikesandbirdsbob wrote: Hi what is the white stuff on the floor????? My rear yard , refuse to call it agarden now is just brown and wet. Hi Bob We had about .05mm of snow early this morning...my 'yard' is much the same as yours...well the bit of it that isn't under water that is. Hi , Have not seen a snow flake as yey in Essex /London borders. Expecting it soon. Today was excelent as sunbathing midday in the garden.Love your girls . UGH!!! I just don't think I'm chicken owner material! 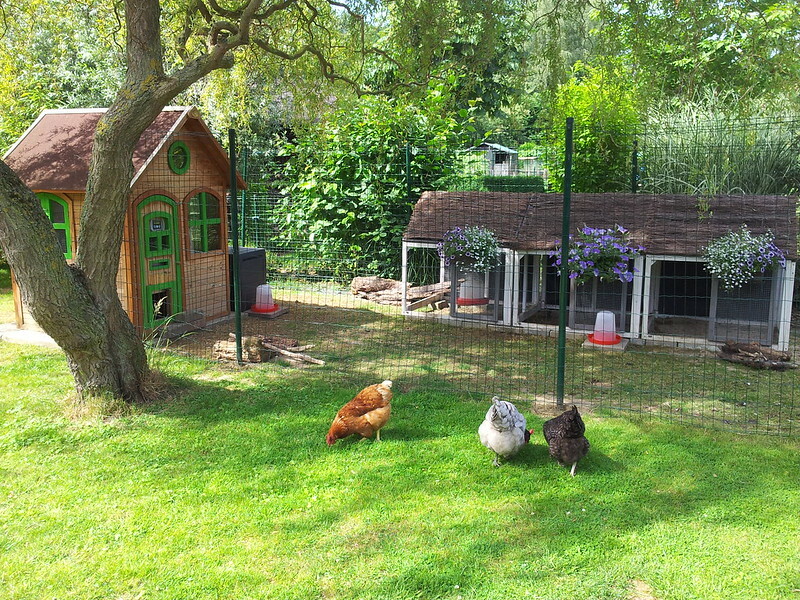 When I dreamed of getting chickens I envisioned an area for them that would enhance the garden. I did consider that the winter wouldn't be a picnic. I guess I'm just weary of the constant discussion over where best to put them, how to keep them high n dry where I want them, how to deal with going away on holiday. Was I dreaming?.....looking through rose colored spectacles?....being a foolish chicken keeper wannabee? Is this normal? Is the first winter just a shock to the system? I'm sorry folks!! I know I'm ranting here and you all seem like such a cheery lot! To top off all of the latest flooding issues and having to move the girls and their Wendy house (which weighs a TONNE btw) I now have Miss Kitty breaking out of their new enclosure to lay eggs under a bush in the garden. (I've just got a net up for now because these new digs are temporary) Mouse is moulting! The water keeps freezing and we are leaving for our ski holiday on Friday. I pay a local teen (VERY WELL) to look after them but with everything that's going on I feel like I have to leave him a long list of stuff to do for them. He's not going to be able to come first thing in the morning to sort out frozen water. I think it's just the winter blues....I HATE these short days!! Sorry to be such a whiner! 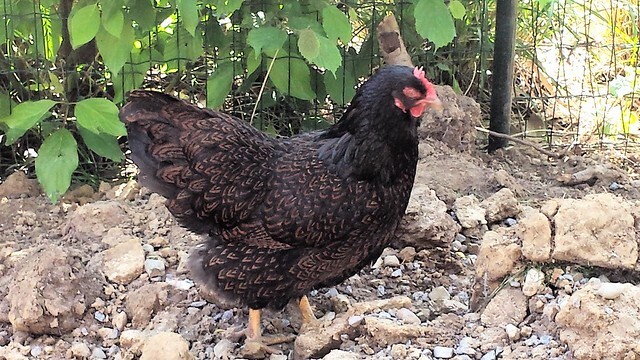 At least Pepper's not broody...touch wood! Yes, winter is a pain when chicken keeping. The slush, the mud, the wet, the poo, the cold... which is why we always encourage people to at least roof their runs as it does make things easier. So once you've settled on a permanent location for them, do yourself a favour and roof the run. Then put woodchips or sand on the floor as that will also help. Frozen water - fact of life. If your teen chickensitter can come and give them fresh water at some stage in the morning then that's fine - if it's forecast to be cold maybe have them come again in the afternoon in case the water re-freezes. Mouse will be fine with her moult, you won't miss Kitty's eggs while you're away and tell the teen they can hunt out and keep the stray eggs. Put extra netting up higher, extra water and food containers out and really don't worry about them! They are quite hardy and as long as you've got the teen in once a day they will be fine. I use margerine or ice cream tubs for my water containers, and in winter I wrap them in bubble wrap and garden fleece for insulation (including underneath), put them in an upturned cardboard box and have them against a wall to try and keep the freezing to a minimum. It's not perfect but they do tend to freeze a little less. You could see if you could get some of those foil blankets they use for camping and such, for insulation? If the worst comes to it, you could always partition their wendy house off and put the water in there for them. Google frozen water on the forums and see what everyone else does. And be wise enough to know the difference. I am sure you will survive just enjoy your holiday - If you are paying someone -give her/him a list least he /she can follow it . That can't be true! I've seen photos of your garden! It looked lovely!!! I suspect I just need to let them out for a couple of hours a couple times a week. They have enough space in their run. I don't really want more than 3 because hubby and I are pretty much on our own now that the boys have started at uni. Three chickens keep us pretty well supplied with eggs. Planning to put A LOT of sand down. I may even try to talk my husband into letting the landscape guys put down some gravel then a membrane and sand on top. If we put in drainage and build up their run they should stay high and dry. Thanks for the reassurance Karen!! Today I've been putting up some more secure fencing and I spoke with my chicken sitter's father. He will check the chickens first thing in the morning and the boy can pop round on his way home from school. They seem like they aren't at all put out by any of my worries so maybe I just need a holiday. Thanks again for the posts! It's been an exceptionally tough season! I want to keep my girls and my husband likes having them around. I just don't want all the grief. These are the photos I tried to upload earlier....I don't think this is un-achievable...do you? Also, I think that three hens can live happily in the space I've given them so there's no need to let them out every day....is there? Sorry for all the moaning...I really do appreciate your advice and insight. Bob...you're right! I need to sort out what I can and not worry about the rest. I think I need a good dinner, some tea and a mini-magnum (ice-cream) and a good sleep and all will be brighter in the morning. I think you're wrong about dinner, tea and a mini magnum. You should definitely go for a full sized magnum! That was my trouble .I have put on 1 stone since November . 2 litres of ice cream a bag of Pop Corn and chocolate watching the tele .Dont share choc as not good for the dogs and cats ????? Pop Corn another story , even the chocks join in . My girls give the sob story all the time if they are locked up you would not believe their looks and noises . Let them out and it was not quick enough and when their out not enough treats . Not in the kitchen back door staulking . Tell I am a best parent and the chocks andthe rest get more spoilded than enough. I just wanted to leave a link here in case I (or another member) need to find it. There has been a lot of upheaval lately and I know it isn't easy on my girls but they are now in their new run with sand! It has been built up about 30cm so they should stay high and dry. BUT!!! !....Just when I thought things would get 'back to normal' I went out today to find that my best laying hen has eaten an egg! I'm not sure if it is only the one but when she saw me go to collect the eggs she came running into the coop and snatched the last bit of remaining shell up and ran off with it! Please tell me I can get her to stop doing this! I've heard that once a hen starts eating eggs they may not stop. It's really stormy here today but once the weather is better I want to take some nice pics of the girls and their new digs!! Thanks so much to the lovely members of this forum for helping me out with my questions....Thanks to the 'Lord of the Lane' for this site and all of your hard work! Poor Miss. Kitty!!! She's the one who ate the egg! I really think that she's just upset about all of the changes lately. I've been watching them a great deal today and she's running up and down the fence making the worst racket! Ugh! I must post pics soon as I can. The weather today really has been dreadful! I read somewhere that if you put some dummy eggs in the nesting box that might stop a hen from eating eggs. When they try to peck them they won't break so the hen gives up. The trouble with Miss. Kitty is that she's smart and I'm not so sure I'll fool her. Still trying to investigate the problem. Maybe the egg just got stepped on and that's why she ate it. Honey has laid a nice little egg today...BLESS!!! She's still young so her eggs are little...cute!!! So I know all the girls laid an egg and that Miss. K ate her own egg. There were two others in the box so it's not like she broke them all and went on a feeding frenzy! Ha Bob! I have to limit myself to ONE Mini Magnum....sometimes I do slip and have a nibble on chocolate or (the worst!!!) CHIPS! I LOVE Chips!!! SALTY YUM!!! About Miss Kitty - was it a soft shelled egg? Sometimes if they break they will scoff the lot up, including shell. I've seen my girls chase each other round the garden for a stray bit of softie shell they've missed. As you say, if the egg happened to get broken they will take advantage. It's quite a leap to becoming an egg breaker though so don't judge Miss Kitty quite yet. Is she getting enough calcium and protein do you think? I don't think it was a soft shell...at least the bit I saw was not. This morning I went out to find Miss K sitting on an egg. I just reached under her and took it straight away. Mouse and Pepper have 'done their job' this morning as well and although I've taken the eggs as I've found them they did get to lay there for a bit and they were not broken or cracked. Honey still needs to lay today but being young she may not....what ever....no worries!!! I've cleaned out their nest boxes and replaced them with clean bedding so there is no trace of egg there...I don't know if chickens can smell but I thought it best to make sure the bedding is deep and clean in the nestboxes after yesterday's incident. They are all out free ranging now. Honey is still an outsider but I really hope this will not always be the case. Hi, You can never tell what nature will turn up next. I try reading up as much as possible so as not to get shock syndrome. But it still can only be a case of watching them and seeing when something different occurs. The way things are going I will be a chicken quack doctor. I watched a youtube vid on bumblefoot and a scalpale was used . Going to get some tape and iodine from chemist today have another look at reds foot. They suffer pain a lot better than me . I am crying / wincing at the thought of it all.